Sometime during the 1990s I watched a dramatic TV show that brought me close to tears as I thought a much loved character was about to be killed off. What is surprising is that that show was the second series of ‘The Simpsons‘ (episode 11 geeks!) and the character was Homer Simpson! The reason I had a tear in my eye was because Homer ate a badly prepared type of fish consisting of some poison and was told that he had only 24 hours to live and so made a list of things he wanted to do on his last day on earth. 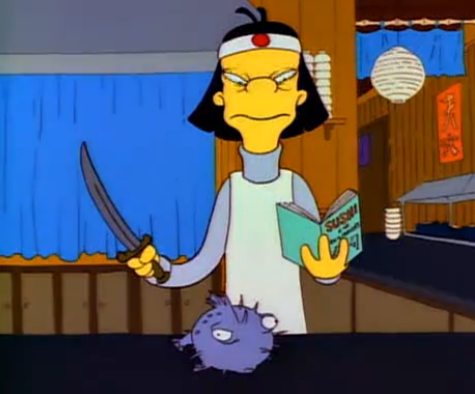 I had little knowledge back then that the fish with poison was actually real and called fugu (blowfish or pufferfish in English) and that it can only be made and sold by specially licensed sushi chefs. A number of people die every year from eating this fish as they under-estimate the amount of poison in certain parts. Despite all this, it is considered to be a delicacy in Japan and I finally got round to sampling this dish last Saturday when a 60 year old business student of mine called Masafusa very kindly treated me to a fugu course at a restaurant in Ikebukuro. This included fugu sashimi, fugu tempura, fugu soup, fugu nabe, fugu zousi and so on and very nice it was too but I don’t think my taste buds can really detect much difference between that and other types of sushi which is fortunate for me as I didn’t have to foot any of the bill which was nearly 9000 yen each (about 45 pounds)! However, the story doesn’t end there as when I got home I was actually rolling around in pain as yet again my stomach didn’t agree with what I had eaten or had I met my fate and contracted the highly toxic tetrodotoxin poison? Obviously not the latter as I am here now and luckily I recovered before the idea of making a list of ‘things to do before I die’ had even entered my head!! 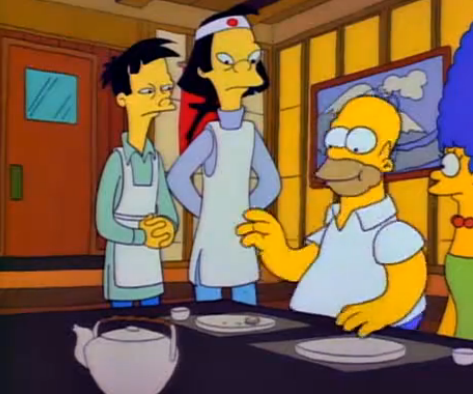 This entry was posted in Food & Drink, Japan Life, TV Shows and tagged Blowfish, blowfish tokyo restaurant, Bluefish, One Fish, puffer fish, the simpsons fugu episode, Two Fish, watch the simpsons S02E11 online free, where to eat fugu in tokyo. Bookmark the permalink.